The animal cell coloring worksheet has been used with freshman biology for years as a supplemental way to learn the parts of the cell. This is often assigned as a review or reinforcement exercise. Intro biology classes have unique challenges for me, one of which being that they don’t have a textbook. This version of the cell coloring includes a cell diagram that is numbered so that students can find the parts without consulting a textbook. The numbers then correspond to descriptions of the structure with its function or role in the cell. 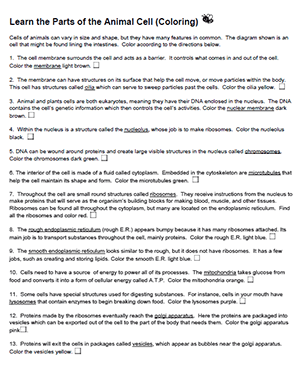 Students can use this worksheet as a stand-alone exercise in learning the parts of the cell. All of the answers are found in the descriptions. To complete the assignment, students color the cell according to the directions and complete a simple matching exercise at the end.